A FREE e Book of hidden blessings revealed. An ordinary moment or a troubling obstacle can be an opportunity to open to God’s grace. But how can you know? These stories that will help open your eyes to these unexpected blessings. Many of us struggle with difficulties: relationships that are broken, illness that threatens to sap the soul of its strength, loneliness, money troubles, the fear of death. Yet there are men and women of all ages who respond to these troubles with optimism and faith—and in return receive an unexpected blessing. In this Free eBook you’ll meet people whose real-life stories will inspire you to live every moment of your day with renewed hope and trust in God. You’ll have one inspiring story to uplift your spirit, every day for a week. So you can start every day with a story that will help you recognize God’s hand in your life. These ordinary people will tell you in their own words the surprising ways in which God appeared in their lives, giving them the inner strength to overcome problems that seemed insurmountable. You’ll discover how an awareness of God in their lives opened their eyes to the everyday miracles to be grateful for. Sometimes it’s hard to feel God’s presence in the world, or in your life. God can feel far away. God is never far away. And when you read these stories of faith and hope, they will strengthen your ability to recognize God’s call in your life. These stories will uplift your spirit. Bring cheer to your heart. And help youfind the strength within when you’re experiencing life’s trials. Feel a greater, deeper connection to Christ. 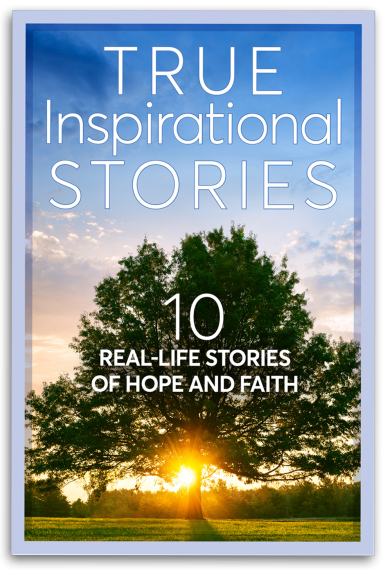 Download True Inspirational Stories: 7 Real Life Stories of Hope and Faith today.